It’s a gorgeous Autumn day; the kind that lures you outdoors with brilliant colors, mild temperatures, piles of fallen leaves. This late in October we are reminded that days like this are limited, there is a sense of urgency to get out and enjoy every last one. 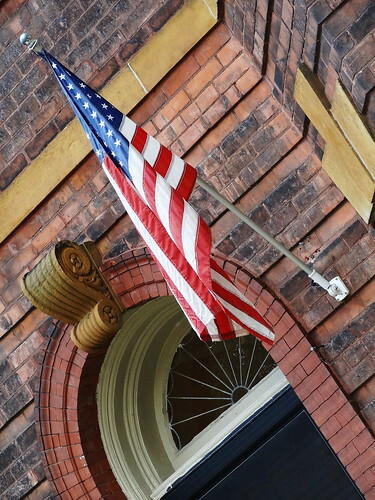 It’s hard to find a prettier, more charming neighborhood than West Village at this time of year; beautiful historic homes, mature trees, shops and cafes, all quite walkable. 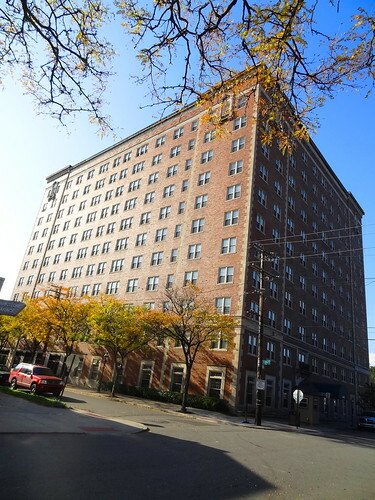 Bordered by Jefferson and Kercheval, Parker and Seyburn, the neighborhood is a perfect mix of single family homes, luxury apartments and small businesses. Let’s go for a walk. 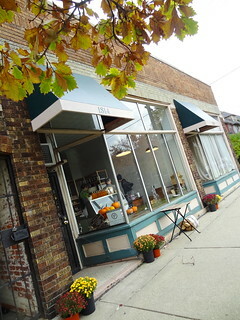 Near the corner of Kercheval and Parker stands Parker Street Market; opened since April, it was an immediately hit with the community. It’s a step back in time to when every neighborhood had a corner store; a place where you could grab milk, bread, lettuce, chips, baked goods and a cup of coffee. 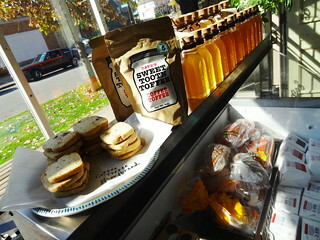 Today’s version carries organic produce, raw juice, Michigan made products and local honey. The cute little storefront is flanked by potted mums, large front windows afford us a view of the tasty treats that await us inside. The interior is a work in progress, as more items are added there is cause to change and rearrange. The tin ceiling is ornate, the floor, dark wood, shelves and coolers line the walls. Sister Pie has been busy stocking shelves with Salted Maple Pie, Buckwheat Chocolate Chip Cookies and a tray of shortbread. 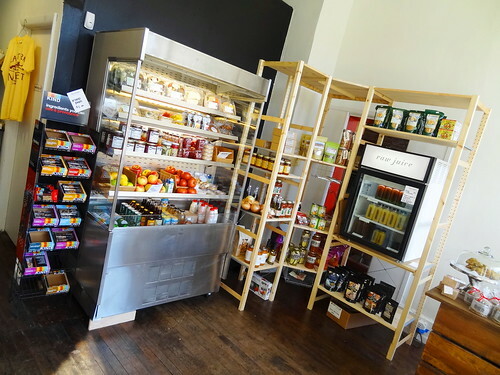 Bottles of Drought juice fill a small refrigerator, ready-made salads, wraps, Calder milk, local pickles and produce stuff a cooler. Dry beans, French baguette, chocolate bars, Dave’s Sweet Tooth Toffee, tea, salsa, jam and bags of coffee from Populace tempt shoppers. 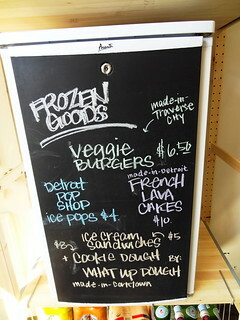 French lava cakes, ice cream sandwiches and veggie burgers await purchase in a small freezer, if you’re hungry you’re sure to find a fix here. We purchase our shortbread cookies and we’re off. 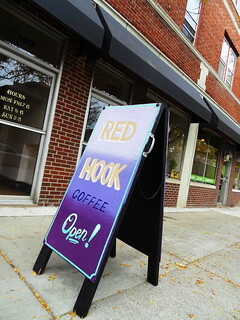 After much anticipation The Red Hook coffee shop opened on Agnes Street earlier this month. 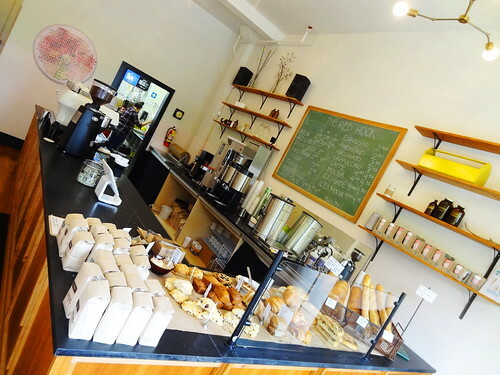 Serving Stumptown Coffee, fresh-baked goods from Pinwheel Bakery and Zingerman’s, neighbors wonder how they ever got along without the cafe. Gold letters spell out The Red Hook on the front window, inside, coffee perfumes the air, pastries are arranged on brown paper that covers the counter. The space is bright; walls are off-white, light-colored wood makes up the built-in seating, sunlight drenches the space. I order a dark roast, Kris chooses cold brew, service is super friendly, the coffee is really good; cups in hand we’re out the door. Steps away, the door to Tarot & Tea stands open, we wander inside. The shop has a peaceful, elegant feel to it; silky cloths cover tables, a couple of chandeliers light the room, a frilly framed mirror hangs on the wall; near the back is a reading room behind heavy drapes. 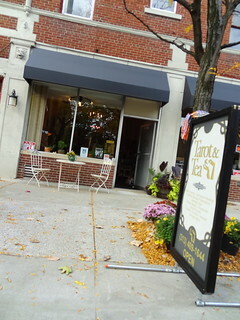 The shop offers goods and services; you can relax with a cup of organic tea, have a tarot card or spiritual reading, pick up a unique gift. 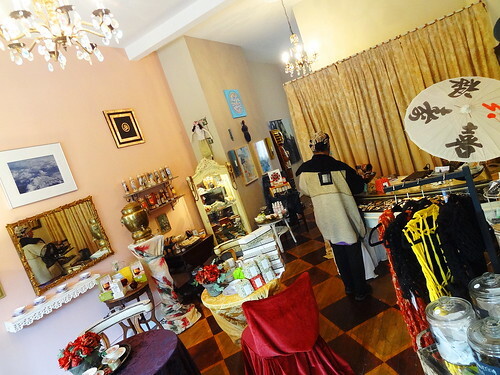 We browse through the store looking at lovely items such as vintage jewelry and clothing, tea, herbs, crystals, candles, oils and body products. A steady stream of pedestrians wander in and out; open less than a month, people are just discovering the boutique. We stroll down Parker towards Jefferson, I love this time of year, the dark green grass a marked contrast to colorful leaves. 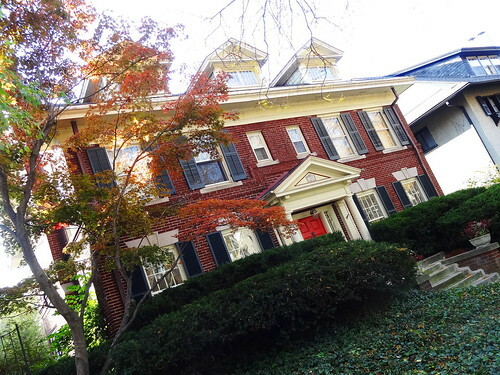 Well-kept houses are big and bigger, each a different architectural style. 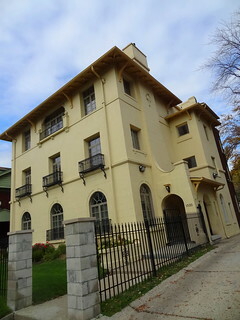 Kris likes the variety of porches, some with room for two chairs, others mimic the piazza’s found in old southern homes. 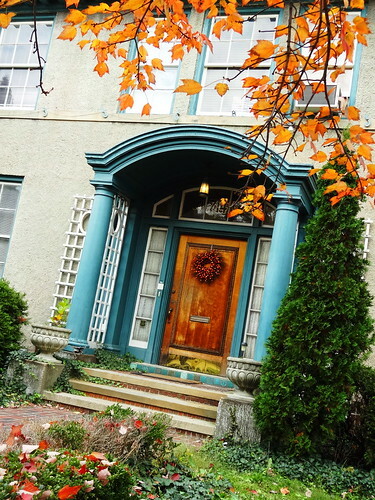 Mature trees surround Queen Anne’s, Tudor’s, Mediterranean and Georgian Revival’s; pumpkins dot porches and landscapes. 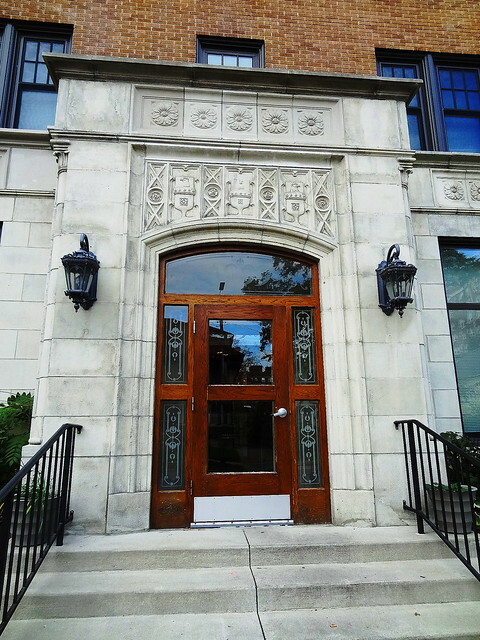 Entrances make a statement; leaded glass, lanterns, arches and carved wood are stunning. West Village is just west of Indian Village (hence the name…) I remember being told many of these homes were built for the children of the wealthy families that resided in Indian Village. Most houses are three stories, brick and stone are the materials of choice, multiple chimneys shoot up from rooftops, columns are popular too. 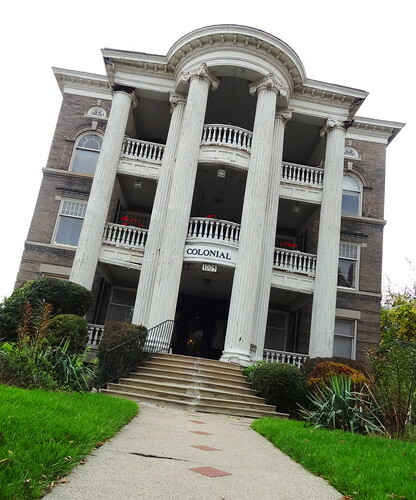 Speaking of columns, The Colonial is a massive gray brick apartment building that looms on the corner of Parker and Lafayette; towering columns stretch from the first story to the third, massive balconies hang from the upper floors, rounded steps lead to the front doors. 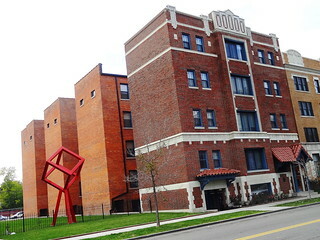 The building is a least a half-block long, it is divided into 6 units, each about 2,000 square feet. We are lucky enough to have been inside, let me tell you, it’s splendid! Making our way to Seyburn we pass tall brick apartment buildings, built at a time when money wasn’t an issue, design details like carved stone, tiles, balconies and lots of unique shaped windows are common. 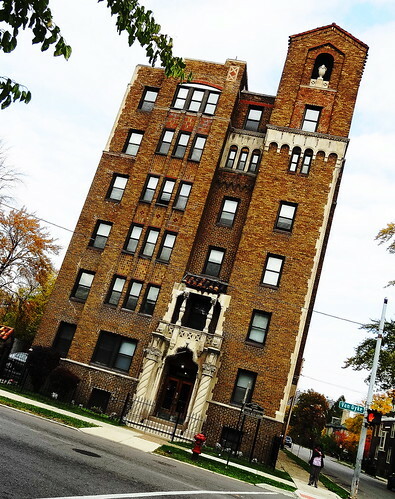 We have been in several of the apartments for open houses, they’re huge, complete with multiple fireplaces, richly detailed plaster, best of all they’re quiet. 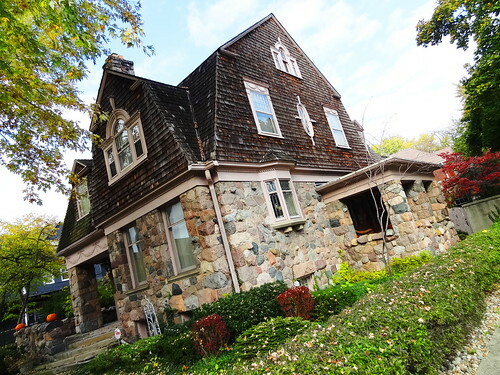 A corner house constructed of large stones on the bottom and wood shingles on the top still has a covered entrance from where the carriage would stop and let the family into the house; cars were not common when many of these beauties were constructed. 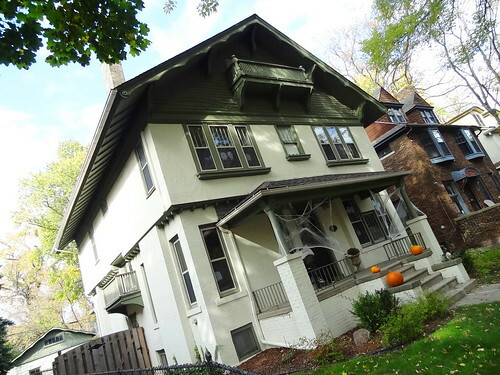 A fancy yellow Dutch Colonial catches our eye, originally (1896), this was the home of Julius Melcher, a notable Detroit sculptor. 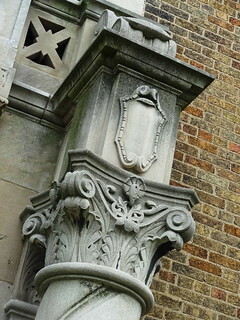 The centerpiece is, of course, the ornately carved gable, which Melcher did himself. Nearby, another house uses large stones, the huge porch accessible through wide arches, it reminds me of a lodge. 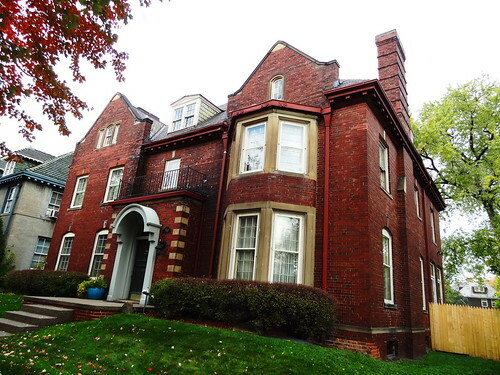 Of course there are the turrets, what is it about a home with turrets that I find so appealing? We walk and walk, stopping here and there to study a particular structure, churches, doorways, capitols, tile roofs, sculptures and facades. 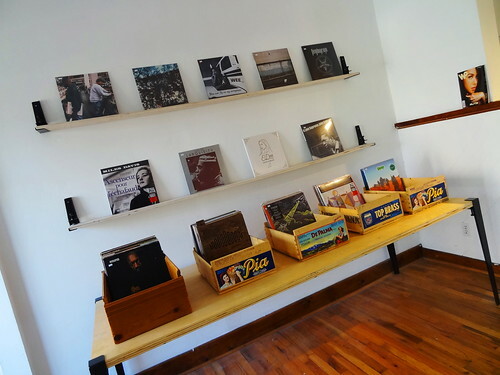 There is an energy of renewal going on in West Village, the newest example being Paramita Sound on Van Dyke, a brand new record shop that opened over the weekend. Stationed inside an old house Paramita offers new, used and re-issued vinyl records—yes, I said records! We had a chance to talk with the founder Andrey Douthard, he told us besides records, the shop has a listening lounge for in-store performances, the shop will offer beer, listening stations and a chance to listen before you buy, cool! As we head back over to Agnes, we pass the West Village Bark Park, a dog and his owner bask in the afternoon sun. 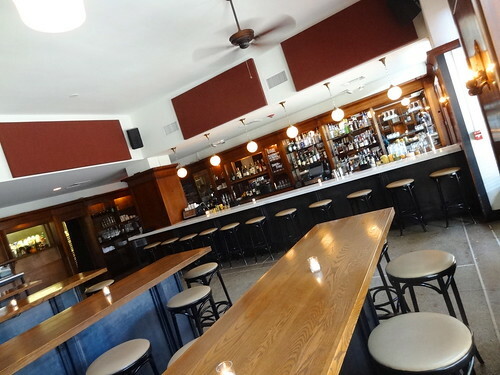 The Parkstone has been a West Village landmark for decades, we pop in to have a look. 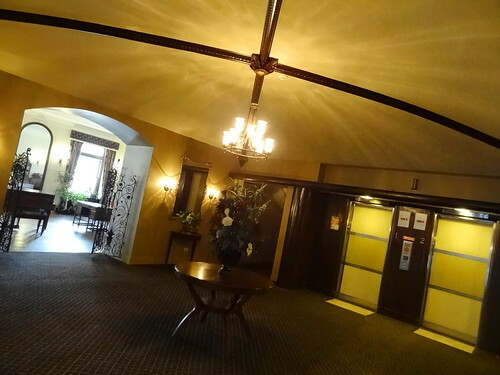 The lobby remains old school, a round table rests below a chandelier in the center of the space, to the right is the desk, rows of wooden cubbies hold residents daily mail. 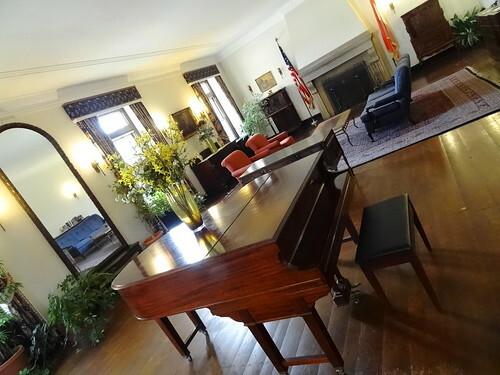 To the left is a lounge area, through delicate iron gates wide planks make up the floor, plaster molding surrounds the ceiling, a piano sits quietly, a massive fireplace fills the far wall, chairs and couches make up several seating arrangements, just like the old days. At last 4:00 has arrived, that’s when Craft Work, a new restaurant and bar on the first floor of the Parkstone, starts serving for the day. 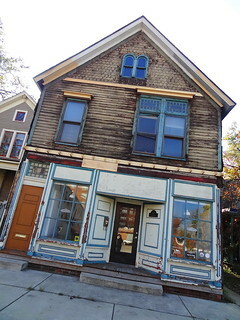 If you are a long-time Detroiter, you may remember the space from when it was the Harlequin Cafe, and for a very short time Coffee and (____) popped up in the space. We are delighted when we get inside and see little has changed; the beautiful woodwork looks freshly polished, built-in shelves hold volumes of books, photos, mementos. 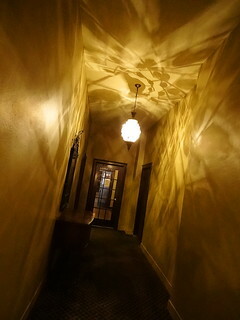 The terazzo floor remains, simple globe lights illuminate the room. Stools line long communal tables, this is the bar area, the dining room opens later, we are here for the Happy Hour. For now we are the only patrons, our server is cheerful and knowledgeable about the menu. We place our order, the server returns quickly with Kris’s cocktail, a Lemon Drop, I am tempted by the sugared rim. As we wait for our meal, folks start to trickle in, it’s Friday and everybody is anxious to kick off the weekend. 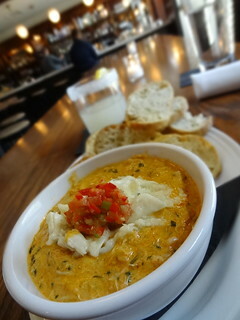 First out is the Crab Dip, a delicious combination of spinach, artichokes, crab, mascarpone and spices; the pile of sliced baguette disappears rapidly. The cheeseburger arrives wrapped partially in white paper accompanied by thinly cut fries, the menu listed ‘cheeseburger’ so we’re not sure how it’s dressed. 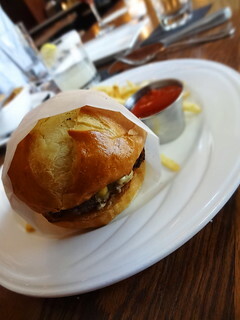 We each grab a half, take a big bite and enjoy the burger. I couldn’t tell you what kind of sauce or seasoning they use, just that it’s scrumptious, as are the shoestring fries, a friend has joined us, she’s savoring a fish taco. Taking our time, we finish our food and drinks, happy to be back in such a handsome, quaint place. What a perfect way to end the afternoon! Thanks for this write-up. I have always loved and appreciated The Villages; ever since I was a little boy. The architecture and the density makes it such a dynamic area of the city. I definitely plan to invest in that area. I will admit that I took Detroit for granted when I lived there, but now that I live in Los Angeles, I can’t wait to get back to Detroit. Do you profile other neighborhoods like this? Detroit is just starting to re-designate and claim the neighborhood names of long ago (of course not Corktown, Green Acres, Sherwood, Rosedale, etc) and I think that is great. You should do more profiles. Thanks. Thanks Aaron. 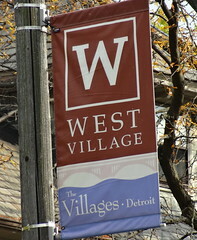 Detroit has amazing neighborhoods; West Village of course, Indian Village, Boston Edison, Palmer Woods, Woodbridge, well, you get the idea. It’s wonderful to see people moving back, restoring houses, opening small businesses, creating vibrant communities once again. C’mon back to Detroit, we’d love to have you!